Wolverine meets with the senior staff at the school to discuss current problems after which Kitty teaches future history 101. Deathlok guest lecturers and tells a few students how he sees their lives unfolding in the future. Angel now reborn and devoid of his original personality tries to bring a dog back to life. 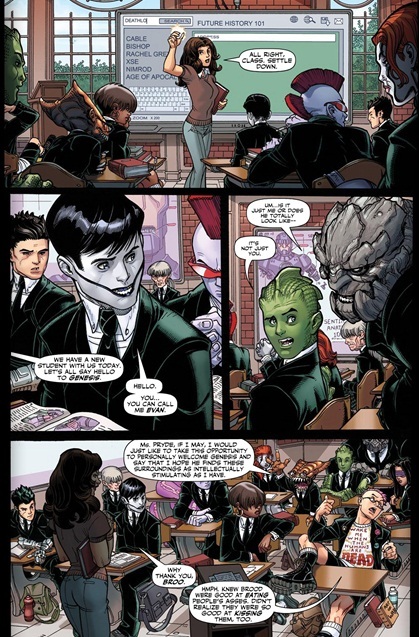 Iceman takes him back to the school after confronting Wolverine over what has happened to him. New student Angel and Genesis are introduced. Kitty starts exhibiting “morning sickness” upon entering the bathroom her pregnancy enters the advanced stages. Cover- Now this is more like it! 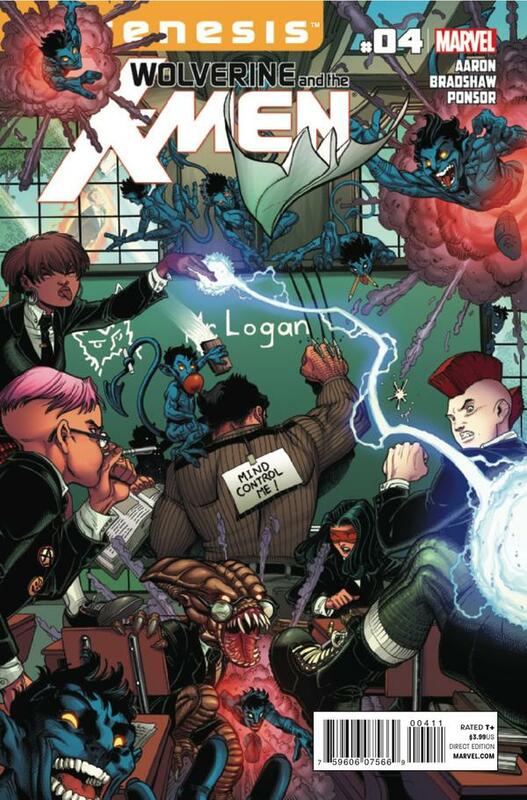 The chaos of a mutant school in full chaotic swing! I really dig this! Dialogue- The exchange between the staff at the beginning of the story sol me on picking this up next month, this is what I would’ve wanted in the first three issues. If things continue in this vein I will be back and may even check into the Jean Grey School of Higher Learning. Art- Welcome Nick Bradshaw goodbye Chris Bachalo! Things look great! Student boy– I love Kid Omega at this school. He’s ten times the douchbag Hellion ever was + he’s a dangerous criminal in need of reformation. He and wolverine have bad blood from back during Grant Morisson’s New X-men and it’s great to see it explored here. 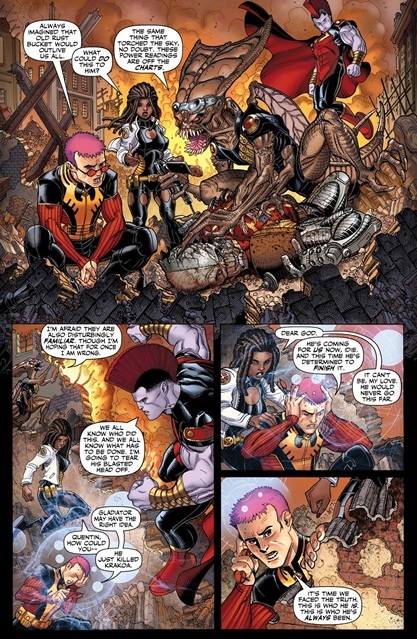 Humor- I think I’ve fallen in love all over again with Quentin Quire and the naïve Broo. Beast and various other characters also supplied a healthy dose of the chuckles throughout. Continuity- It’s always cool when stories in one book impact another and Uncanny X-force the Wolverine kill team’s “Dark Angel” storyline spawned “New Angel” an Apocalypse clone “Genesis” find their way to the school and make for many future potential stories. Story- This title always had potential but this may be the best use of the characters yet. The student body has great chemistry! Quentin Quire the bad boy, Broo the nerd, Idie the dumb chick etc another selling point is the staff. For the life of me I don’t think any student would take Kity Pryde as headmistress seriously! Looking at the staff only Rogue has grown enough to actually be headmistress and sure Wolverine can lead though his skills are more in the murder and mayhem category. This school just seems like a train wreck waiting to happen on every conceivable level, strange enough that’s the main draw! No school of mutants before has had this kind of zany staff mismatched staff or so many unpredictable and potentially dangerous students all at once. Jason Aaron my man, I’ll be keeping an eye on this school! Black Superheroes- Idie Okonkwo and Gentle are at home here at Jean Greys….I like it! Hypocrisy- Wolverine is still the biggest hypocrite in the mutant world. Student safety– These students are in even more danger than before being at this school. Wolverine kills people in his spare time…what happens when one of them escapes and comes looking for revenge during class hours? These students are also not being taught in combat……the last set of student had more combat training (the new x-men) and they were slaughtered when a real combat situation arrived….these noobs are sitting ducks. Apocalypse Jr. and Kid Omega could destroy this school with a thought…..should they be in the student body or in containment somewhere? I’m just saying?! They could have gotten a better artist one of the iconic marvel characters .the art will drive me away by issue 5 I guarantee.